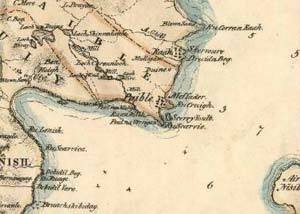 Paible/Paibeil, on the island of Tarasaigh/Taransay is the only one of the three Paible names to be located on a small island in the Outer Hebrides - an island which was not ever called Pabaigh/Pabbay as far as is known (Fig. H7.1). It is only a short distance from Pabaigh, Harris (H2), both of them being in the same parish (an unusual situation). 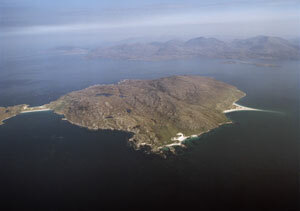 Like Pabaigh, which lies at the west end of the Sound of Harris, largely hidden from Tarasaigh by Gob an Tobha (Toe Head), it is one of the larger islands lying off the fertile west coast of Harris. 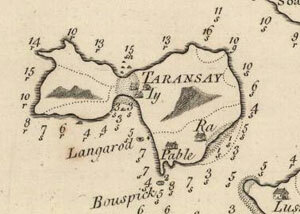 Even though some distance to the north, Tarasaigh is sometimes confused with Pabaigh on early maps, such as that of Tiddeman in 1730. Tarasaigh is divided almost in two, the smaller western part, Aird Mhanais/Vanish, connected to the rest of the island by a wide sandy isthmus at the head of Loch na h-Uidhe. Uidh, one of the three townships on Tarasaigh lies immediately to the east of the isthmus, close to a cross-incised standing stone known as Clach an Teampaill. The eastern part of the island rises to the high central point of Beinn Raah, confining the machair, and consequently the principal settlement areas, to the south eastern fringe of the island (Figs. H7.2 and H7.3). The largest of the three townships, Paibeil, where the two chapels, St. Keith's and St. Taran's are located, lies at its most southerly point, looking across the Sound of Taransay (Caolas Tharasaigh) to the west side of Harris. Tarandsay, ane ile of fyve myle lange, haffe myle braid, ane rough ile, with certain tounis, weil inhabit and manurit; bot all this fertill is delved with spaides, excepting sa meikell as ane hors pleuch will teill, and zet they have maist abundance of beir, meikel of corn, store, and fishing. It pertains to M'Cloyd of Harrey (1549 (1994), 517-8). Bald's estate plan of 1804-5 shows the township boundaries of Uidh, Paibeil and Raah, enabling each township to access a wide range of resources (Fig. H7.6). Raah included the north eastern side of Tarasaigh, with Paibeil taking up the larger half of the eastern part of the island. Uidh incorporated a narrow strip along the western slopes of Beinn Raah and the whole of Aird Mhanish. Uidh and Paibeil had become single farms by the early 1800s, with Raah being converted into a number of crofts in 1826; the crofters of Raah were cleared in their turn in the 1840s, leaving only a few cottars at Paibeil (Lawson 1997, 29-30, 37ff; Lawson 2002, 43). Prior to the Clearances, the picture may have been more complicated. The mass of lazybeds on Aird Mhanish (NMRS no. NG09NW 17, SMR no. 12067, centred NG 0050 9950) and the possible small townships at Lainis (NMRS no. NB00SW 10, SMR no. 2388, centred NB 0068 0010) and Aird Tro (NMRS no. NA90SE 1, SMR no. 2374, centred NA 991 003), both of which are enclosed, may reflect pressure caused by population expansion in the later eighteenth century. When the island was cleared in the early part of the nineteenth century, the population was less than half its total of 140 in the 1790s (cf. Lawson 2002, 43, 45ff). Alternatively, they could be the homes of those looking after the stock, pastured away from the principal areas of cultivation and used mainly in the summer. 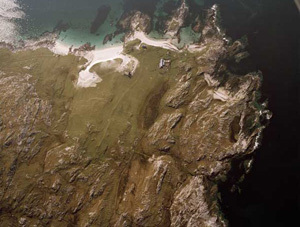 The small groups of lazybeds and buildings visible on aerial photographs around the bays at Chleiteir, Camas an t-Saoidhein and Rubha nan Totag, 'point of the ruins', on the north coast of the eastern half of the island, may have originated in a similar way. south-east with Paibeil in the foreground (SC 1004371, taken 25 April 2005. Donald MacDonald in Eye being sworn, deponed that the yearly pay of the Four pennies of Eye possest by him is One hundred and thirty three pounds six shillings eight pennies Scots money rent, Ae marte, Eight pounds Cess, Twenty one pound six shillings eight pennies tegnes, Twelve bolls meal, Sixteen stones half butter half cheese and Twelve wedders. As also deponed that the Three penny lands of Raa possest by Kenneth Campbell pay yearly Sixty six pounds thirteen shillings four pennies money rent, Ae marte, Six pounds cess, Sixteen pounds tegnes, Four bolls meal, Twelve Stones half butter half cheese and Six wedders, and that the said places pay Noo more, which he depones. Finlay Morrisone in Pabiil being sworn depones that the yearly pay of the said place, being Four pennie lands, is Eighty pounds money rent, Ae marte, Eight pounds cess, Twenty one pounds six shillings eight pennies tegnes, Twelve bolls meall, Sixteen stones half butter half cheese and Twelve wedders, and Noo more (Harris estate rental in Dunvegan papers, quoted in Lawson 2002, 41). Acres Decls. Acres Decls. Acres Decls. Acres Decls. Acres Decls. There are a number of names on the island, such as Eisgeadail, Debidale, and Shinnadale, which incorporate the ON element -dalr, valley, and which imply the importance of the grazing resources of Tarasaigh. That Tarasaigh was also part of a more extensive system of land use is indicated in several ways. The people of Beàrnaraigh landed their horses at Caigil, on the west side of Aird Mhanish, on their way to the Forest of North Harris for the summer grazing (Lawson 1997, 25). Cattle from Tarasaigh also went to North Harris, at least in the later eighteenth century (ibid., 27), while the much smaller island of Gàisgeir provided additional summer pasture. Most of the remaining population of Tarasaigh were tempted away by Lord Leverhulme's schemes to create work on the mainland of Harris in the 1920s, leaving the island to sheep and a few lobster fishermen. Tarasaigh was finally abandoned in the 1970s and is now run as a sheep farm from Horgabost on the Harris mainland (Lawson 2002, 50). About a League farther to the North [of Pabaigh], lies the Isle Taransay, very fruitful in Corn and Grass, and yields much yellow Talk. It is 3 miles in Circumference, and has two Chappels, one dedicated to St. Tarran, the other to St. Keith. THERE is an ancient Tradition among the Natives here, that a Man must not be Buried in St. Tarrans, nor a Woman in St Kieth's, because otherwise the Corps would be found above Ground the day after it is Interred. I told them this was a most ridiculous fancy, which they might soon perceive by experience, if they would but put it to a tryal. Roderick Campbel, who resides there, being of my opinion, resolved to embrace the first opportunity that offer'd, in order to undeceive the Credulous Vulgar ; and accordingly a poor Man in this Island who dyed a Year after, was buried in St. Tarrans chapel, contrary to the ancient custom and tradition of this place, but his Corps are still in the Grave, from whence it is not like to rise until the general Resurrection. This instance has delivered the credulous Natives from this unreasonable fancy (1703 (2003), 48-9). In Harris, where, till within a few years back, there has not been, since the aera of our reformation from popery, so much as one comfortable or even decent house for public worship, there were of old not less than 12 churches and chapels, of which the greater part of the walls, though some of them be in a tottering condition, are yet standing, beside several others, probably of a more ancient date, which, having mouldered away into heaps of rubbish overgrown with moss, may still be traced, whilst tradition points out their situations, and has carefully preserved their names. They were either dedicated to saints or designed after the names of their several patrons or founders. Of two, in the Island of Taransay, one was called Teampull Ché, and the other Eagluis Tarain. Tradition is totally silent in regard to both. Even of the names, as transmitted to us, the best we can make is conjecture. The name of the last strikes us as bearing a similitude to that of the island, which is, perhaps, derived from the same original. There is a St Tarnanus mentioned in the ancient Martyrology, who is called by Fordun, the Scotichronicon, Tarananus ; Archbishop Usher says he was bishop of Lismore in Ireland, and in the early ages of Christianity planted many churches among the Scottish and Pictish nations. 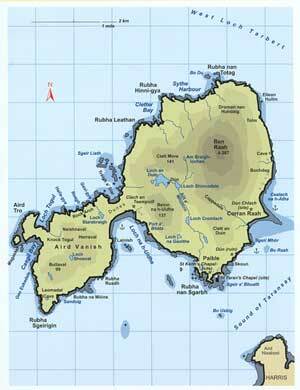 Who knows but the church and Island of Taransay may have taken their names from him? (Macleod 1792, 376-7). The Taran of Eagluis Tarain is probably the St. Torran or Torannán locally believed to be responsible for the conversion of the Western Isles, even though his main sphere of influence appears to have been in the east of Scotland (Mackinlay 1914, 106-7; Watson 1926 (1993), 298-300; Carmichael 1928, 80-3). Torannán - although suggested to be Thor by Macculloch (1824, 147) - was either the son of a noble Pictish family who became a supporter of Columba or, as the tradition survived in Uist, a bishop, rejected in Ireland, who found refuge amongst the Picts (Watson 1926 (1993), 298-299; Carmichael 1928, 80-2). Tarasaigh is unusual in that the Gaelic name of a saint appears to have been linked with the Norse word for an island (Watson 1926 (1993), 300; Jennings 1998, 49, 51). The saint to whom the second chapel is dedicated is even less well-known. There is a standing stone called Clach Ché in North Uist, while Ché is also incorporated into several place-names (most often as Keith) in eastern Scotland (Carmichael 1928, 82). Ché was replaced by Keith in later editions of Martin Martin, but, while Carmichael appeared to believe that the two names were synonymous, Thomas was not as convinced (Thomas 1863, 116; Carmichael 1928, 82). Watson also appears less sure that Ce, (one of the seven sons of Cruithne, who gave his name to the province of Mar and Buchan), and Keith are equivalent in Gaelic, suggesting that Keith derives from a St. Keith, whom he does not go on to identify further (1926 (1993), 114-115, 515). Not until the second half of the nineteenth century do more detailed descriptions of the chapels survive, although T. S. Muir, in his 'ecclesiastical' tour of the Hebrides, omitted Tarasaigh and the other outlying islands of Harris. In 1863, Captain Thomas described St. Taran's chapel as 'still very distinct', although stone from it - including a simple cross-incised slab - had been used to build the nearby tacksman's house for John Macdonald in the 1840s (1863, 115; Lawson 1997, 33; Lawson 2002, 47; see below). At around the same time, Carmichael, one of the Ordnance Survey's informers, noted that 'there were two small churches, of which nothing now remains but the foundations, with a small burying-ground attached to each' (1928, 82). He may, however, have simply been following Martin Martin, as Thomas does not mention separate graveyards, though he did record that the two chapels were separated by the 'trifling rivulet' which defines the western edge of the machair at Paibeil. Thomas goes on to account for Martin's story by suggesting that there had originally been separate religious foundations for men and women on either side of the stream and that the tradition of burying men on one side of the stream, with women on the other, had been preserved by the 'country people' (1863, 116-7). It is just possible that the legend noted, but not recounted, by Compton Mackenzie of a fight between Catholics and Protestants on Tarasaigh, which resulted in the dispossession of the Catholics, may also be related to the question of the two chapels (1936 (1998), 10). large and thick with a piece on the left back of it about 4 by 3 inches clearly cut off as if with the sword. The piece is there. The sword cut in the skull is about 4½ or 5 inches long. Forehead rather receding and skull very thick - a large man's skull. Close to this a skeleton whose bones were something awfully large - the end of the femur about 4 inches broad and the rest of the bones equally large (quoted in Lawson 2002, 39-40). 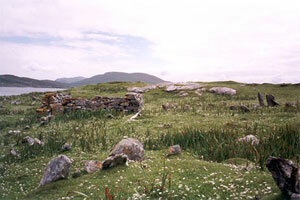 At Paible, a township on the south-eastern shore of the island of Taransay, are the sites of two early chapels. The stones having been removed, all that remains are two slight mounds within a few yards of the shore to the south-west of the township. Both chapels seem to have been orientated east and west, the mound of the western chapel, St Keith's, measuring 21 feet in length by 12 feet in breadth, while that of the other, St. Taran's, which lies 38 yards to the east, is 32 feet long by 18 feet broad (RCAHMS 1928, 31, nos. 109 and 110). In 1969, when visited by the OS surveyor, St. Taran's Chapel is described 'as a rectangular hollow, bounded by the slight remains of turf-covered walls' (information contained in NMRS record). It measured approximately 10.5m E-W by 5.5m N-S, although the south wall - as well as the south-east quadrant of the graveyard - had almost disappeared due to coastal erosion. In 1956, they had found the remains of St. Keith's chapel rather less obvious, but to comprise grass-covered banks, with a few loose stones visible in the north and east walls (ibid.). This corresponds to its appearance in 1969, when the chapel survived only 'as vague turf-covered footings measuring about 6.3m E-W by about 4.5m transversely, with a maximum height of 0.3m'. The OS surveyor believed both chapels to lie within the same burial ground (ibid.). Even more recently, Lawson thought that there was nothing left of Teampull Tharain or its graveyard, 'unless a few masoned stones at the base of the sand-dune below the steading of the MacDonalds' were part of it, while Cladh Ché was also eroding (1997, 36). Within Cladh Ché is Caibeal nam Fidhleirean, the chapel of the Fiddlers, named for a family of Macleods from North Harris who worked as shepherds on Tarasaigh in the nineteenth century, while Tobar Ché, to the west of the graveyard, was the principal well for the village (ibid., 28, 36; Lawson 2002, 39; a well to the north east of the school is shown on the OS First edition map (1881), but does not appear on later maps). Approximately twenty years after John Macdonald's house was built at Paibeil, a cross-incised stone was identified, re-used as a lintel, within the house and removed by Captain Thomas in 1861 to the Museum of the Society of Antiquaries of Scotland (1863, 115; Fisher 2001, 5; Fisher 2002, 44; this stone is recorded in the NMRS and SMR alongside St. Taran's Chapel). The small slab of syenite, now broken, has an incised Latin cross on one face (Fig. H7.5B). The side-arms have circular depressions at the terminals, which appear to have been matched by similar terminals at the top and foot of the shaft, although these have now been damaged by flaking (Fisher 2001, 113, no. 52). There are similar depressions in each of the four angles of the cross-head, which suggest the influence of the 'jewelled' crosses of Mediterranean art, also reflected in crosses at Luss, Ellary and Iona (ibid., 13). A second cross-incised stone has survived at the head of Loch na h' Uidhe, a tall pillar of gneiss, with a bold outline Latin cross on one face (Fisher 2001, 113, no. 53; Fisher 2002, 44; NMRS no. NB00SW 4, SMR no. 3993, NB 0128 0077; Fig. H7.5C). It is located on a grassy slope above the beach and west of the later township. The OS surveyor identified a possible building platform immediately to the east of the stone, but this has not been recorded by later commentators and there is no structural - or historical - evidence of any chapel site as indicated by the name, Clach an Teampuill, the 'stone of the chapel'. These two stones on Tarasaigh, in conjunction with carved stones from North Uist and fragments from Beàrnaraigh (Harris), stand in marked contrast to the total absence of any carved stones from the whole mainland of Harris and Lewis (Fisher 2001, 11). The bay where boats are landed now is called Miosadar, with Rubha na Cruaich, the point of the peat-stacks, to the east and Sgeir Bhuailte, from where Eoghann [MacRae] swam across to Horgabost, to the west. But Miosadar sounds more like a land-name than a sea-name, and it is the bay on the other side of Sgeir Bhuailte - Am Bagh - which has the landing place names: Laimrig an Arbhair, Laimrig an Eorna, the landing of the harvest and of the corn. The old folk used to say that at a very low tide at Miosadar, you could see the roofs of houses under the water, and although that had to be an exaggeration, it was perhaps a memory of the days when the village was in Miosadar, before the sea broke in. I am the more inclined to believe that when I look at Rubha na Cruaich today. Where we used to wheel barrowloads of peats from the point to the houses, the sea has cut through, leaving a sand cliff of up to twelve feet in height. On the sand face it has revealed a beautiful prehistoric midden, full of empty shells and pottery. But the sea is still eating in, and soon the midden will have gone too, and its contents will be spread along the beaches towards Raa (Lawson 2002, 49-50). This name [Paibeil] is applied to a small hamlet of very miserable looking huts, some of which are almost underground. There is one farm house only which is one storey & thatched but far superior to the other houses, which are occupied by cotters, who each manage to make a living by fishing, as they are not allowed to graze cattle or sheep on the island (Ordnance Survey 1878, Original Object Name Books, Inverness-shire, Book 4, 225; cf. Lawson 1997, 30). In the shore below the chapel foundations [St. Taran's], erosion has exposed several set stones and a shell midden containing bones and pottery sherds, and it appears that the chapel occupies the site of an earlier domestic structure. More midden material is visible in an eroded slope c. 15.0m E of the chapel (information contained in NMRS record for St Taran's chapel). (SC 1004373, taken 25 April 2005. Midden deposits up to 1m thick have also been identified 'immediately beneath and adjacent to St. Keith's chapel' (Simpson, Crawford and Ballin Smith 2005, 11). In addition to the cross-incised stone, Thomas records a bone pin, with an eye at one end, and a small bronze buckle of 'a rather unusual form' from Paibeil (1863, 118; NG09NW 6, centred NG 03 99). He believed both finds to have 'formed part of the funeral trappings of some early Christian', although he does not specifically say where they were found (Thomas 1863, 118). Although the machair at the back of Paibeil is still green and fertile, the far more rocky and marshy areas surrounding it to the west and north, which appear as rough pasture on the OS First edition map (1881), are covered in lazybeds, enclosures and lengths of more recent dyke. The mills for the island lay on the Allt a'Mhuilinn, just above the point where it turns to the west along the edge of the machair at the back of Paibeil. The north eastern boundary of the area of good ground at the back of Paibeil is marked by a dun, the interior of which contains an apparently much later rectangular structure (RCAHMS 1928, 38-9, no 118; NMRS no. NG09NW 3, SMR no. 1358, NG 0358 9961). The dun is separated by a narrow area of rough pasture from Raah, the next township to the north and, on Bald's map, it lies just within the boundary dividing the two townships; the head-dyke appears to cut across its outworks. According to Thomas it was known as Dun Rhàtha, 'the dun of the rath', or Dun an Oir, 'the Golden Dun', the latter because of the tradition that some golden ornaments were found there (Thomas 1890, 398). In spite of its name, Dùn Clach, behind Corran Raah, is described in the Name Book as 'the remains of an ancient cairn . called a fort by the natives on the island, but nothing definite is known about it' (Ordnance Survey 1878, Original Object Name Books, Inverness-shire, Book 4, 225; NMRS no. NB00SW 2, SMR no. 42, c. NB 0414 0046). It is no longer visible, but there is a midden close by (NMRS no. NB00SW13, SMR no. 42, c. NB 0422 0044). Finally, in Loch an Duin, there is another dun, possibly constructed on an artificial island, which has potentially much later structures within it (Thomas 1890, 397; Blundell 1913, 300; RCAHMS 1928, 38, no. 117; NMRS no. NB00SW 6, SMR no. 46, NB 02162 01279). This is possibly the island settlement, called Borg, which appears on Blaeu's map of 1654 as one of the three settlements on Tarasaigh. Ordnance Survey, 1878 (1881). Inverness-shire. First edition. 1:10,560. Sheet XII. Ordnance Survey, 1901 (1903). Inverness-shire. Second edition. 1:10,560. Sheet 12. Ordnance Survey, 1971 (1974). 1:10,000 series. Sheets NB00SW; NG09NW. Ordnance Survey, 2003. 1:25,000. Explorer 455 (South Harris/Ceann a Deas na Hearadh). Edition A. Ordnance Survey, 1878. Original Object Name Books. Inverness-shire. Harris. Book 4. NAS RH4/23/106. Institute of Geological Sciences, 1981. 1:100,000. The Outer Hebrides. Lewis and Harris South. Solid Edition. Soil Survey, The area of the three townships is class 6/1, while the rest of the island is 6/3. There are, unusually, two 'papar' places close together in Harris, Paible/Paibeil on Taransay and Pabbay/Pabaigh (H2). This may explain why the island of Taransay/Tarasaigh was not called Pabbay, and the Old Norse place-name papa-býli used instead for the ecclesiastical settlement on Taransay. 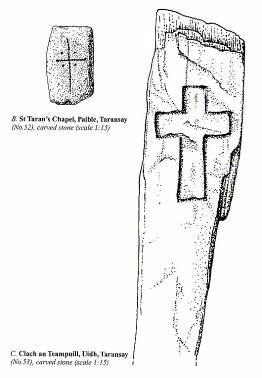 They are both places where there is a pronounced surviving ecclesiastical element, for there are (or have been) two churches in both places, while Taransay has produced some early sculptural evidence. Pabbay/Pabaigh is known to have been markedly fertile, and this was probably also a feature of the east side of Taransay, around Paible, but the changed coastline has clearly much reduced the agricultural area here. The extent of erosion at Paible is difficult to evaluate, but was certainly severe (see quotation from Lawson above), and the shoreline is still eroding. Pabbay/Pabaigh is strategically located with respect to the Sound of Harris (see above H2) and Taransay/Tarasaigh would appear to have a similar position with respect to the portage at Tarbert. It has a controlling position on the sea route leading into West Loch Tarbert and access to this important portage across to the Minch. These strategic considerations, along with the resources which both islands could provide, would make them exceedingly valuable supply bases for travellers or raiders moving up and down the western seaways of Scotland.